Long time no blog! I’ve let the dust to settle down before sharing my 2 cents of thought. Apple finally bows down to competitors to make bigger phones. The hardware and specs are decent, not spectacular, and they don’t need to be for commercial reason. The design are still top notch, better than its competitors, all it needs indeed is to make consumers feel that iPhone is still a premier product that deserve premium price. The chip and sensors are marginal upgrade from 5s, expected. My view is that iPhone 6 and 6+ are probably the beginning of the end of hardware renovation for iPhone. Cuz, what more can Apple does? Unless they make a hologram, minority report types of projection, etc. Otherwise, that’s pretty what we will see in years to come. i.e. 6s would have the same physique, 7, 7s, from round edge back to sharp edge, may be Sapphire glass, liquid metal be used for materials. Maybe Apple will make color metal cases, etc. That’s pretty much what the incremental change it would make. Size will stay for at least next few years if not permanent. 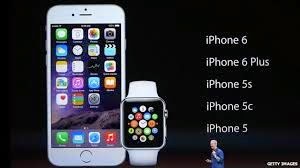 What really would change are internal, upgraded sensor, chip, battery and the killer iOS. That’s about it. The killer for Apple, as I mentioned in many posts before, is its ecosystem of hardware, software and services. ApplePay is surely the latter one. It is not a very innovative thing, it just as most of other Apple’s services incorporated in its ecosystem, just works! The most important thing is the lure of banks and merchants to buy in this services and to become an industry standard in next 2-3 years. Apple doesn’t need to do much but getting fee from every transaction! That will ensure a new stream of cash flow. I’m pretty sure ApplePay will succeed given it simply makes payment easy. This service will do if not more than the iTunes App store to Apple, 30% charge on Apps. Apple just opened a gold mine! I’m less a skeptic of this product than many naysayers. To be honest, for both iPhone and iPad, my first purchase of them were happened to be the 3rd gen of the products. I want an AppleWatch, but I don’t need one, at least for now. So, as usual, I will stay tune to let Apple fine tuning this product before I hop in. What are current problems or issues that I have with the 1st gen AppleWatch? Yes, many spec have not been released, but the following suspicions at the moment would still be largely believable. Battery – nightly charge is no good. Sure, I nightly get my iPhone recharged, shouldn’t matter to recharge another thing. But, it should be going reverse, to have better iPhone battery so I don’t need to recharge it daily. Watch is smaller and so does its battery, but people would expect a smaller screen size shouldn’t consume a lot of power that requires daily recharge. Yes, a magnet recharger is nice, but what matter is the other end of the recharger that it is connected to - Still a bulky backup portable battery! Apple gotta do something about it, be it to be recharged remotely or via kinetic action or something. Stay tune to Apple to acquire some small companies that can do those things in next year or two. Size – the belts are nice, I’m sure 3rd party dealers will do much more than that. Stay tune to Louis Vutton, Gucci, etc to come up with their belts for AppleWatch in next year or two. The problem of the watch itself is that it still looks a bit bulky! It looks too thick! I would say that it will definitely be improved by in next gens as a major selling point by Apple, the only roadblock is the battery. A tough case to crack! I think the UI is innovative with those circle icons, but it would demand learning and memorization by users to recognize which icon is which. Also, I’m not sure if it is easy to spot the right icon for people with big fat fingers. The digital crown is nice, would want to see more details about that. The watch can do wi-fi. I’m not sure if I would buy in the map feature that it shows in keynote. The screen is simple too small and if it has to work with iPhone, why don’t I just take the phone out and look at it? Also, about the use of Siri, I’ve concern of the audio volume. The health sensor is a nice touch, ApplePay indication is nice too, but I think Apple is still waiting for a killing app to drive its sale. Anyway, I’m pretty sure I will buy an AppleWatch…in few years. Also, I’m not assured if it is informal to spot the right icon for people with large fat fingers. The digital top is nice, would want to see more particulars about that.